The Insignia presses come standard with built-in high capacity feeder, capable of accepting up to 36" (91cm) of stock in one load. Utilizing a true guide and gripper system, the Insignia can feed, register and die cut material ranging from 0.004" (approximately 60 gms) up to 0.026" (approximately 430gsm). 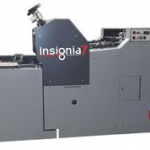 Insignia 7 can be offered as either a single or a dual magnetic cylinder press. There are 2 delivery options available with an Insignia Die Cutter. 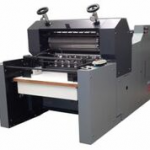 A waste stripping unit will remove skeleton and delivery individual cut pieces onto a slow moving conveyor or a high capacity receding stacker designed to accept full cut sheets and stack them in a descending stack for removal later.